See, it's a pun because I made a Silhouette with my Silhouette. Punny, huh? Okay, enough of my lame-o humor. You'll have to forgive me cuz I found my first gray hair today, and I'm in mourning, so my sense of humor is off. No really, I screamed when I found it...nearly gave the poor hubby a heart attack. He didn't get what I was all worked up about. See, the hubby started going gray in his twenties. But me? Until today, I prided myself that I've made it to the age of 30 without any gray hair...okay, okay, you caught me...I'm not 30...I'm 38...but that's even better, no gray hair. Until today that is. Darn it all. But I digress. Where was I again? Oh yeah, silhouettes. 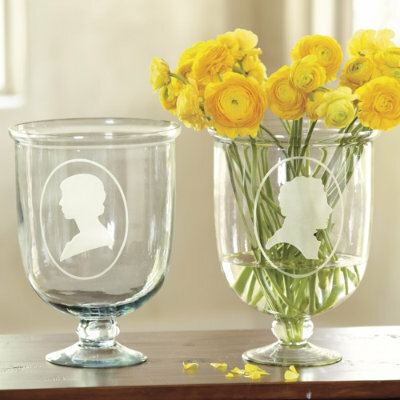 A while ago I saw these darling vases in the Ballards Catalog. Love them. And since my little DIY-loving self gets a thrill out of doing cost-next-to-nothing knock-offs, I just had to share with you what I made. The former inhabitants of this house left us a storage room brimming with canning jars. So I went down to said storage room and dug up a couple of pretty ones that didn't have embossing on them. 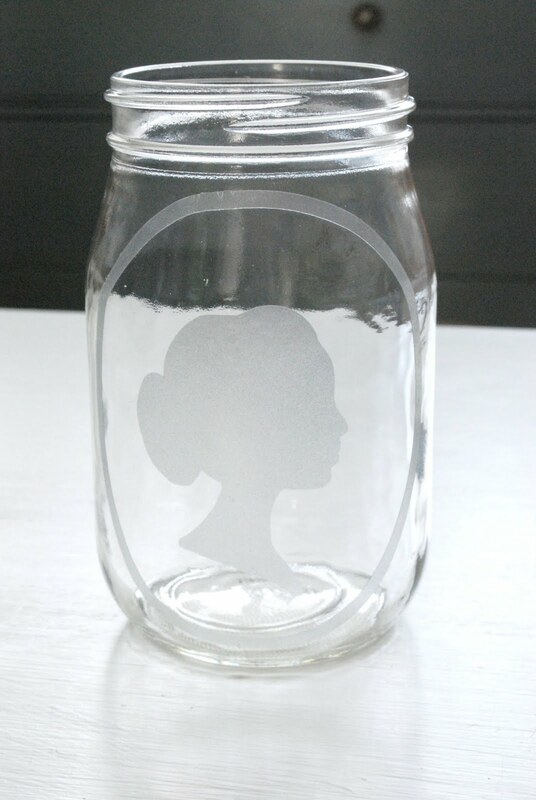 Then using my Silhouette Digital Cutter I cut out a Silhouette using their Frosted Vinyl, which I then place on one of the jars. I really like the way they turned out. Not quite as elegant as the Ballard's version. But cute nonetheless...and my version was FREE people. Can't beat that. That's a huge savings! $395 worth of product for only $225!! Already have a machine? No worries. They're also offering 25% off premium vinyl. Just use the code SHABBY at check out to receive either of these great discounts! 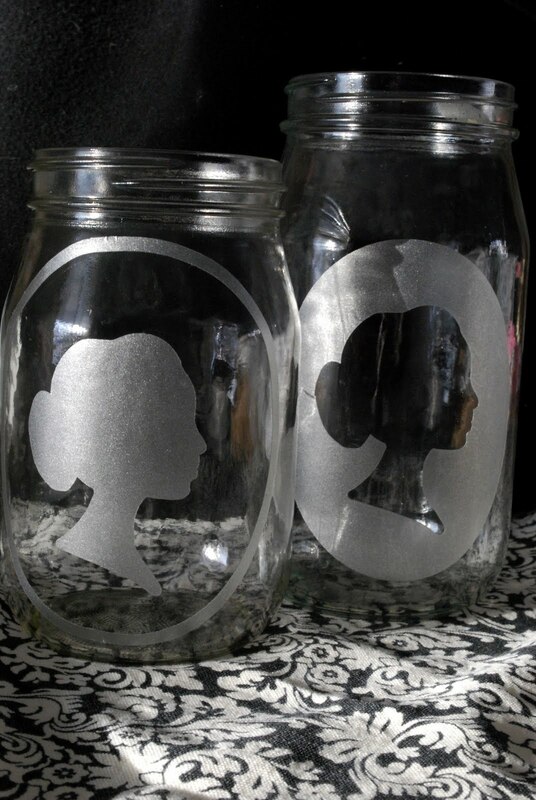 Then you can have some Silhouette punny fun too!! Catch y'all later...I'm off to search for more gray hairs. Oh those are so beautiful! 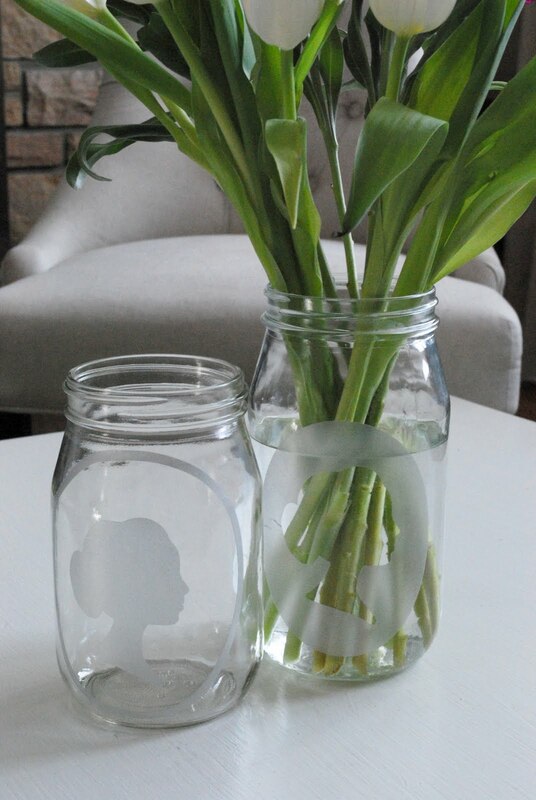 I like the jars you made better than the vases! I so wish it was in the budget to get one of those great machines! Someday - hmmmm -maybe a good Mother's Day gift - right?! I just had to laugh. I remember the day I found my first gray, but it really isn't that bad...luckily the person who does my hair and I are great friends. That is such a great idea! Great job. Haha...Don't feel bad. I'm 30 years old and I've already started getting a few gray hairs! I blame it on my 2 and 4 year old boys :) Cute project by the way! Love these! I think they turned out great! The first gray hair is a doozy, isn't it? I found mine a couple months ago. :( I didn't think it would bother me that much but it so did. I almost cried. I love the jars. Very cute! I'm 31 and I have a streak, yes, I said a STREAK of grey. Oy. Does that maybe make ya feel better? Those look great! I love that you used the frame of the silhouette too! Great idea! Love how simple and beautiful these are! I'll be 40 in a couple of weeks, and although I'm sure there are gray hairs up there on top of my head, I have not seen one to date. The woman that cuts my hair is also a good friend, and she hasn't given me any delusions... I have spotted grays though - one coming right out of my nose (pesky thing that keeps returning) and one that curls OUT OF MY EAR!!! When I'm old and in the home, I hope I have a fabulous nurse or daughter in law who wisks the darn things away before I have to see them. Love what you did with this!!!!! silhouettes = so cute. i don't know how something so simple can look so classy but, darn it, it does! This is such a great idea! I really want one of those vinyl machines!! I am saving just so I can get one!